Welcome to Poway Pediatric Dentistry! We would like to take this opportunity to introduce you to Poway Pediatric Dentistry. Our Award Winning office is located at 15835 Pomerado Rd., Suite 303 in Poway, at the intersection of Pomerado Rd. and Bernardo Heights Pkwy. We are a few miles just east of the 15 Freeway in the north San Diego county area, near Rancho Bernardo, Rancho Penasquitos and Escondido. We are a full service pediatric dental specialty office offering comprehensive treatment for infants, children, adolescents, and special needs patients. Our services include comprehensive pediatric dentistry, sedation dentistry, general anesthesia dentistry, hospital dentistry, emergency dentistry, and limited orthodontics. 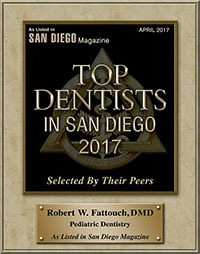 Dr. Robert W. Fattouch is a board certified pediatric dentist who was been in private practice for over thirteen years. He started Poway Pediatric Dentistry in March of 2012, after being at one of the most prestigious pediatric dental groups in Arizona for seven and a half years. Originally from Diamond Bar, California, Dr. Fattouch graduated from Diamond Bar High School and then went on to attend the University of California, at Riverside.